Well hello there friends and happy weekend! So nice to see you here on a Saturday. I’m absolutely tickled pink about today’s post because it’s all about giving back to you lovely people! It’s a GIVEAWAY!! I’ve joined forces with my friend Becky of Farmgirl Paints to give one of you lovely ladies a gorgeous leather cuff in honor of your awesomeness! You’ve heard me talk about my love of leather cuffs a few times before. I actually mentioned it in this Friday Favorites post a few weeks ago. I have four from Becky’s shop now and I absolutely love them. Each one says something different and has special meaning in it’s own way. I’m not exaggerating when I say I wear one of my leather cuffs almost every day of the week. I’m obsessed. Anyway, today I get to give one of these gorgeous cuffs to YOU!! 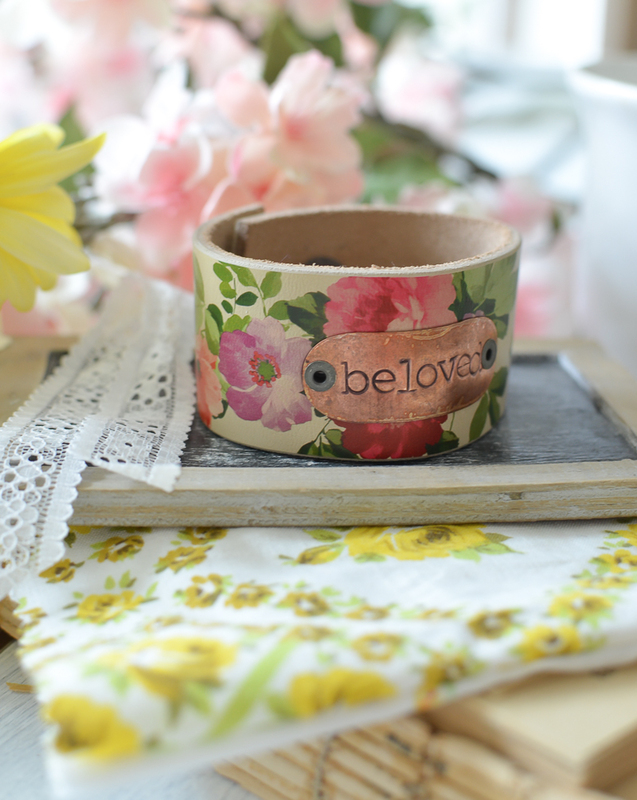 Becky is currently offering a special “shabby rose” leather cuff, which is so gorgeous and I think it’s perfect for Mother’s Day coming up. Just look at this beauty. Isn’t this just beautiful?! I love, love, love the floral design. It definitely has a vintage feel to it, which you know I’m crazy about. Of course I had to get one for myself and I decided to have mine stamped with the word “BELOVED” as a reminder of God’s unfailing grace and faithfulness. I hate to say it, but it’s so easy to forget how much He loves me, especially on days where I feel like I’m failing at everything. I get wrapped up in my own doubts and insecurities and I forget that I’m a daughter of the King. He’s got my back and it’s all going to be ok. This is a simple and beautiful reminder of that love. 2. Simply leave a comment below to be entered. Tell me why you want the cuff, why you love Mother’s Day, or what your plans are for the weekend. Any comment will get you entered! 3. One winner will be chosen using a random number generator. The giveaway closes Sunday, April 23rd at 9:00pm EST. I’ll announce the winner on Monday! And one last thing–Becky is currently running a special promo in her shop for Mother’s Day! Use the coupon code MOM15 for 15% off your order. I know these shabby rose leather cuffs won’t last long, so be sure to snag one soon if you want one! Thank you all from the bottom of my heart for supporting my blog and giving me so much encouragement and love on a daily basis. I wish I could give each one of you a big ol’ squeeze! Or maybe a high five if that’s too much for you. Either/or. These cuffs are beautiful! I’ve never seen a flower one! I’d love to give one to my mom for Mother’s Day. We still meet at my grandma’s house on Mother’s Day after church for a big meal (the guys cook on Mother’s Day) and with my grandma, my mom, myself, and my daughter, there are 4 generations celebrating! A perfectly beautiful reminder oh His love and grace. I spent Mother’s Day in an ICU after surviving a ruptured brain aneurysm. This would make such a beautiful reminder of grace and hope for the future. Hi there, oh how I would Love to win this bracelet, It is Beautiful. So, on Mother’s Day this year at our church, I have made each mother a fan to give to them or they can give it as a gift to their mother. I have been wanting to do this forever. And, by the way they are made from vintage style paper and there are no two alike. Then after church I will spend time with my family. Love them so much. Hope you have a Blessed Day! What a lovely cuff!!!! We should all have a reminder of how unique we are to Him! Absolutely lovely! I would love to show off this beautiful cuff during our annual Mother’s Day dinner. Alsolutely love this piece of jewelry and I have nothing like it! Makes me excited, Spring is here!???? Thank you! I adore the cuff! Would like it to wear, commemorating the day I was baptized – Mothers Day! Love your blog! This is such a beautiful cuff! When I saw it I thought of my mom who I lost almost 10 years ago. I miss her so much and Mothers Day is hard for me but I focus on my beautiful two girls and my beautiful two granddaughters that I am so thankful for. This is what my mom would want me to do, so I will be spending time with them on Mothers Day and remembering my mom in the garden that I planted for her. Thank you for this special giveaway! We will be working in our garden all weekend! I’m so disappointed I can’t enter the competition but I live in Australia. Anyway I still love your blog. I look forward to it every night (that’s when I get it). These cuffs are truly gorgeous and I know whoever wins it will really appreciate and enjoy it. I hope to spend Mother’s Day with my husband and my 3 wonderful sons!!! Love your blog, love seeing all your decorating ideas. Love this cuff it does have a vintage look to it. Mothers Day is such a special day to honor Mothers. If I win this bracelet I would want blessed put on it, God has truly blessed me, which I don’t always deserve. Thanks for the give away. I love this! Reminds me of my mom. She was from Scotland, loved flowers, and always called me rosebud. I would most likely wear this everyday to keep her near; reminding me to stop, pause, take breath, be calm, and always take time to smell and appreciate flowers and God’s beautiful work. I love her cuffs! I bought my daughter one last Christmas and she wears it almost everyday!!! A great gift for my daughter-in-law who is expecting my first grandbaby! I have lost my mom, but I am trying to be a great mom and grandma to my family. Good morning, I am new to blogging and you are the first one I chose to follow and what a good decision, I love your blog and look forward to it each day. I would love to win that beautiful bracelet so I could give it to my grandsons to give to their Mom for Mothers Day. My Mom absolutely LOVED flowers. She has been gone 10 years now. When I wear the cuff, I will have a beautiful reminder of my beautiful Mom. My four lovely daughters are treating me to the stage show Chicago! So excited to just get to spend time with them. Thank you for all the effort you put into your blog. I look forward to reading it daily. I feel so lucky to have fallen upon this blog. You have given me such great ideas to do to our new home that is a true fixer upper! This give away is great! My mom lives in Charleston SC and I live in Lagrange Georgia. She used to live here and this is the reason we moved here. But, her and my stepdad wanted a change. So that is why they moved to Charleston. I sure do miss having her close by, but I know that it’s a short distance away and I can still go and see her. Her and I have been through a lot and I am greatful to have her on my life. This vintage cuff is beautiful and reminds me of the beauty that God has pur into my life. Love that cuff! We are packing to move to our new house in the agricultural district this weekend, and I have found so many good ideas from your blog for decorating it! Thank you!! Words are powerful. Especially on a rose cuff!!!! Love it! Luv the cuff and really love your blog!! These cuffs are beautiful. If I win this I will send it my mother in Florida. She’s been missing her grandkids. I will Def have take order one for myself tho too! It is a very unique piece. I Love it. I will be spending Mothers Day with my husband and 4 beautiful children along with my mom and dad. I look forward to your blog everyday. Happy Saturday! We lost our beloved mother in July – if I were to be chosen, I would give this bracelet to my baby sister – Mom was living with her at the time of her death and, although we have all deeply grieved, my sister has taken it especially hard. This is our first Mother’s Day without Mom and it would be a constant reminder that not only was Mom beloved, but that she is too. I would LOVE to win this bracelet and give it my my sweet mama… but I would love to order one for myself as well. They are just precious! delicate yet incredibly strong. She would love us both to wear a matching one. This cuff is amazing and so pretty! Love wearing arm candy that speaks and tells a story! I enjoy being with my mom and mother in law on mother’s day and being pampered by my own boys and husband! Such a good day! Love the cuff and love your blog you always have so many great decorating ideas and tutorials. I would love to win this cuff! I’ve been swooning over the cuffs for some time but it was never in the budget. A few weeks ago, I was chatting with Becky through Etsy to make sure I was entering all the details correctly, when the one I had in my cart get swept up my someone else! This would be a lovely Mother’s Day gift to myself because let’s face it, mom’s always put themselves on the back burner! So pretty! I love it!!! I have one cuff-would love this one! Mother’s Day is my favorite holiday! Since becoming a mom 21 years ago- I look forward to all the extra cuddles, handmade cards and love every year! This is a beautiful cuff and such a sweet giveaway! That is a beautiful leather cuff! I’m enjoying this absolutely beautiful day with my family! I love your blog and all your DIY’s!!! Love these cuffs and have admired them for so long. Would love to wear one and have my mom wear one with these words spoken over us! Love honoring my mom on Mother’s Day too. I’m always in awe at the sacrifices she made for me growing up and still does now. Love being her baby girl at age 38 still. This would actually be perfect for Mother’s Day. My mom has had the what may be the hardest year of her life and the word beloved that’s already stamped would be so fitting. Love Mothers Day… I’m blessed with a wonderful mother and a mother to two awesome grown sons..What a beautiful cuff. I have one myself and cherish it and the words on it . Love those cuffs so much! What a beautiful reminder of how Jesus sees us…. as His beloved. Mother’s Day is a specia day to me because it reminds me how blessed I am to have 4 kids of my own and how thankful I am for my own mom and mother in law???? I love Becky’s cuffs! I have a lot-some for myself and many that I give as gifts throughout the year! Tomorrow we will go visit with my daughter at APSU in Clarksville, TN. They are having a commissioning ceremony for their summer missionaries at the BCM. My daughter will be serving in South Korea and Southeast Asia! Every day is Mother’s Day for me as I have been blessed with the best mother and I am so very thankful for my own 3 children!!! God is so Good! I just found your blog because I follow Farmgirl Paints on IG! So happy to have found it. Her cuffs are all gorgeous, and I have been wanting one for some time. The shabby rose is beautiful and perfect for spring! Love the cuff! I love little items like that for reminders and also other people to see and be the example. these cuff bracelets are lovely! thanks for the chance to win one … we will al get together at my home …my three daughters ,all moms also, their hubbies and my 6 grandbabies… nice mom celebration! Such a beautiful cuff and a beautiful reminder of how loved we are by our children and by an amazing love from above! I help at a tea room and would love to wear at our Mother’s Day event to remind each mom how loved they are as I have the privilege of loving on them at our event. You blog is amazing too!! No matter how old I get, with Mother’s Day coming up soon, I think of how I miss and will always miss my mom. ‘BELOVED’ reminds me of her unconditional love, now and forever! I just love that floral cuff! There is something about the beautiful, bright floral color and design that makes it feel perfect for Mother’s day. I am hoping to spend the weekend with my kiddos doing only whatever we want! ???? Love the simpleness of the cuff and the constant reminder that I am beloved by my Father. I never knew my purpose in life until I became someone’s mom. It’s like wearing your heart outside your body. These are beautiful! I’d love one just like you have pictured… Beloved. This cuff is absolutely breathtaking. I would love to gift it’s beauty to a beautiful friend. We all need to be reminded that we are His beloved. As Mom’s, we are in “putting our selves last” mode quite often. But He sees our needs, and gives us His love and grace for each day. That’s what the message on this cuff reminds me of. Love ❤️ this floral cuff! Perfect for Mother’s Day and every day. I love spending time with my 3 girls on Mother’s Day and realizing the precious gifts God has given me. This is such a beautiful and unique piece! I plan on spending Mother’s Day with my family and participating in my favorite pastime, shopping at vintage stores!! We are actually in Nashville, home of the sweet Becky! I love her cuffs and have admired the one you are giving away! She is very creative! I just signed up for your newsletter and love the farmhouse print! I am a momma of 2 and Gigi to 3! Love them and teaching them about Jesus! I am crazy about roses ????! The reason is because I have a baby in heaven named Elizabeth Rose who passed away on the day she was born 13 years ago. I have pink roses everywhere to remind me of her ! This cuff is amazing because it would remind me of her and of God’s love ! I would cherish this ! On mother’s day I love to be surrounded with my family and go to church and just be together ???? Having all my family around me is my greatest joy ! I have been eyeing those cuffs for so long! I love that they are beautiful reminders of God’s goodness. I absolutely love shabby chic everything and like you cuffs are my favorite. I lost my mother last year so this Mothers Day I plan on spending with my children and grandchildren. Life is too short and mom will be in my heart and thoughts all day. Happy Mother’s Day to everyone!! I enjoy your blog very much, thank you. The cuff is beautiful. I love Mother’s Day because it gives us all a chance to celebrate the amazing woman who gave us life! I love spoiling my mom a bit and of course it’s a perfect excuse to come together with family for a yummy brunch! Absolutely love…beautiful in every way!!! I am going to celebrate and reflect and honor my Mom in heaven…and be thankful for being a Mom…and Mimi. This is a beautiful cuff! Perfect for spring. Would love to share this beauty with the world when they see it on my wrist! This would make the perfect gift for my daughter-in-love who the the mother of my two amazing grandlettes. It is absolutely gorgeous. I would love to wear it as a message to others showing how awesome our Lord is. I hope to spend my Mother’s Day with my husband and two sons and a daughter-in-law. I will be thinking of my Mama who went to Heaven six years ago. I love and miss her so much. I know I will see her again one day because of what Jesus did for everyone of us. How beautiful! I’ve not seen flowered leather before. I’d love to have it. Thanks for the giveaway. I’m new to your blog but I look forward to it everyday and am anxious to try some things you’ve written about. What a beautiful cuff! Mothers Day to me is a day filled with thankfulness for my mom and my children. It reminds me that my cup of blessings overflows. This cuff is so different from the usual leather cuffs that I’m use to seeing. I was blessed with a wonderful Christian grandmother and mother! It will be 5 years the day after Mother’s Day since she passed. She had such a green thumb and her flowers were always beautiful! The colors and flowers reminds me of her! It’s amazing how God puts little things here and there to remind us of certain things! When I see flowers and hummingbirds it makes me smile because I think of her!! Such a thoughtful thing of you two to give away!!! Such a beautiful cuff! Love the roses. Happy Mothers’ Day to all of you great moms out there. That cuff is the prettiest! I love the word you chose. What a great reminder of His unfailing love towards those who are His. What a beautiful cuff. I can’t write about my own mother. I haven’t had one since I was 4 mine passed away. BUT I can talk about being a mother! Thats all I ever wanted to be growing up. I love it!!!!! I have been blessed with 3 children who make me so proud to be their mother. I thanked the Lord every day for my family. Jenny 37, Michael 35 and Lizzie 22. I would have Blessed stamped on it because that’s what I have been. Beloved is a word that God whispered in my ear 13 years ago, and it was life changing. My name is Hebrew and means Beloved. I had a framed print with my name on it and it’s meaning. It hung in my bedroom most of my 20’s, and I never paid it much mind. I always hated my name and desired to have my twin sister’s name most of my life. One day, I was struggling with self worth and I heard God whisper “My Beloved” and I looked up and my eyes fell on the framed name print. And God began to minister and speak in to my heart about my true identity, as a Child of God. I was transformed! So, when I saw your giveaway away your beautiful Beloved cuff, it spoke to my heart and it’s such a beautiful reminder of that moment of truth where I received the gift of revelation of who I am…literally. “God knew His church wouldn’t be complete without you in it…. God thinks of the nicest things! What a wonderful gift idea. Thank you ! I love your blog and have my daughter-in law now enjoying it, as well!!! I do not have Facebook , but do email…. These cuffs are beautiful! I follow her on Instagram. Everyday is Mother’s Day ❤️ I plan on spending like I do everyday, with my 4 kiddos. It’s so refreshing. Always love proclaiming my Lord as saviour. That’s a beautiful cuff. What a beautiful cuff! I would gift this to my daughter who along with being the mother of our sweet four year old grandson also gave birth to identical twin girls on March 27th of this year. Love…. I am looking forward to Mother’s Day because my husband gives me the entire day off! I get to take a long shower, eat undisturbed, & maybe take a nap!! That cuff would match everything!! Would love one of these beauties for my daughter! I have never seen such a beautiful cuff! So pretty! I absolutely adore this cuff by @farmgirlpaints!!! 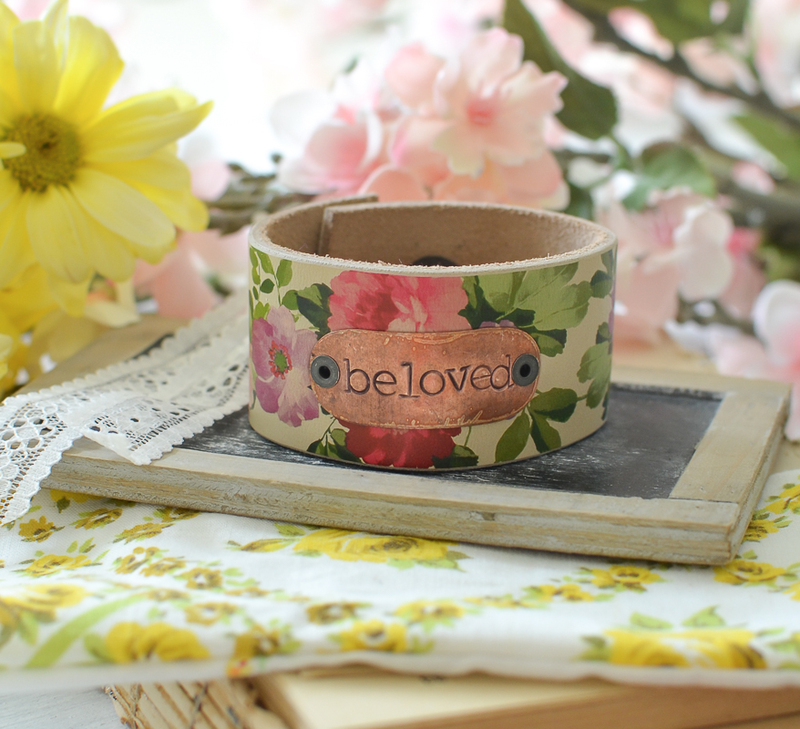 All her work is beautiful and this cuff is perfect for Mother’s Day from the beloved to the awesome floral design!!!! That is just beautiful! The floral design appeals to my vintage soul! I would love a cuff as I don’t accessorize but this accessory is right up my alley. And a great reminder of who I am in him. Mothers day is spent being spoiled by my four kids the best way they know how and it’s adorable to watch them love me in their own way. What a sweet giveaway! That beautiful cuff would make any mother feel very special on Mother’s Day! Have a great weekend Sarah! ???? The cuffs are beautiful! We love going to church on Mother’s Day and then a special lunch out. I love being able to spend the day with the family. Happy Mother’s to all Moms! I will slip this on my sister’s wrist as she fights for her life in ICU in the cancer center. What’s not to love about this cuff bracelet?! Love the roses on this letter cuff, prefect for spring time and Mother’s day. I love the time spent with family celebrating all us moms in the family. It’s an awesome time. This is beautiful. So many moms deserve this for mothers day. As much as I’d be tempted to steal this for myself I’d send it to one of our kiddo’s birth Mamas. They’re beloved in ways they don’t even know. Mother’s Day weekend my husband and I have planned to travel to New Orleans for an anniversary getaway. Twenty one years of learning what love is truly all about… seeking Christ together and pointing others to Him when they see our union. This is the first Mother’s Day morning I will not wake up to my 2 children, but will tuck them in that night with memories I made with their daddy that will last a lifetime. What a sweet addition to my wardrobe for the weekend this cuff would be! I have two and would simply adore a third! ???? Beautiful cuff! Mother’s Day is bittersweet for me because my Mom passed away a couple years ago and I really miss her. But I get to enjoy the day with my son, his wife and our beautiful grandson! This is perfection and beyond beautiful. I would love to wear it and be reminded of His unconditional and eternal love for us plus his endless daily, beautiful grace. Thanks for doing this gorgeous and super cool giveaway! Happy Mothers Day to all the beautiful mothers who gave us life !!! ???? Love the beautiful leather cuff. The colors are so pretty , cheery and springy. I would love to win this as it is very different. Mothers Day is special because it honors all we do and I am fortunate to still have mine. We will probably do a brunch. Hope I win, thanks for the chance. I’m waiting for my first one to get here and would love to add this one to it! No big plans for Mothers Day…hoping to have all 5 of my kids home! Love the cuff. Happy Mother’s day to all the moms out there. Thanks 4 the giveaway. I love the floral leather cuff. Just beautiful. I am the mother of 6 homeschooled adult kids and the mamaw to 16 grandchildren. One more on the way in September. I love the beautiful floral pattern of this! I’ve long-admired Becky’s cuffs, and would love this! ???? I love farmgirlpaints! Her cuffs are the best!! I am about to have my 3rd boy!! I would LOVE a nice girlie cuff for this boy mom!!!! I would love to own one of her cuff bracelets???????????? Roses are my favorite flowers! I just lost my Mother over Christmas, and I would wear this in her honor, as she loved roses & all flowers! I’ve never seen a leather cuff like this…it’s beautiful. I haven’t spent Mother’s Day with my mother for 5 years. We moved to Kansas and she is still in my home state of Georgia. I know I’m lucky, I can still talk to her, but all holidays are just a little bit sad since my family is so far away. I love the cuff! My mom is in heaven so I would love to give this to my sister. She is so much like a mom to me, a beautiful friend and of course my System of that we share our histories with our gardening tricks are painting furniture and decorating secrets!! I knew that she would love the cuff and I can just imagine it on her wrist! Loved my mom so much; she was such a blessing to me! And now, my children & grandchildren bring me such joy. I love the cuff and I think it would be a great reminder to me when there are days of doubt and confusion. I’m planning a train trip for Mothers Day. Love your blog! Beautiful! I love reading all you post. Look forward to my emails! So beautiful! I bought one of these cuffs for my daughter’ dance choreographer. She loved it! And that’s just what we’re doing this weekend…dancing! Actually, the next 3 weekends are filled with dance competitions and recital! What a great word…beloved! I love the floral cuff! The flowers remind me of new beginnings. My son and daughter are both moving out of state so I am in the season of new beginnings! The cuff is beautiful. I would give it to my Sunday School teacher! I’ve had a rough 2 years. She has come along beside me and been there for me during some dark days! My faith and love of Gods promises has grown under her love and teachings. I have to tell you how much I enjoy your lovely blog! These cuffs are so unique and beautiful! I would love to own one!! I would love one of your bracelets because they are so feminine. Thank you for the giveaway. SO pretty! Would love to give this to my mom for Mothers Day!! Thanks for the give away opportunity! To win this bracelet would be an honor. The work you put into each bracelet is amazing. Thanks for the opportunity to win the bracelet. i would love to win the bracelet. It is so pretty and gorgeous. Thank you for this giveaway. I love how florals are making a comeback! I’ve always loved the feminine floral look and I live in a house full of boys! Thanks for the opportunity to win this beautiful cuff bracelet! Love your blog! What a generous offer! Mother’s Day means so much to me. I’m fortunate to have my mom living near by and I admit I totally take her for granted. I don’t tell her enough how much she means to me. St least I feel that way. I’m sure she’d say she thinks I tell her all the time. She’s an encourager. During my teens and early twenties I was told that I would have difficulties getting pregnant so I assumed that I’d be a “career woman” and pushed the thought of having my own children out of my mind. Well I married and ended up with four children! Guess my pituitary kicked in somehow. Yay God! What a beautiful leather cuff! I am a mother of two adult children. No grandchildren, but I have a grand-dog and a grand-cat! 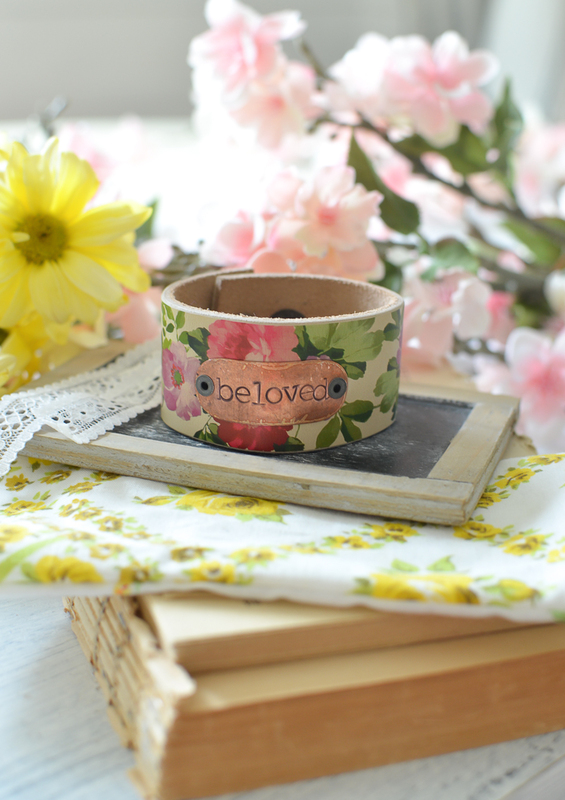 I love the fresh, floral cuff that says BELOVED! I know I’m a BELOVED daughter of the One true King. 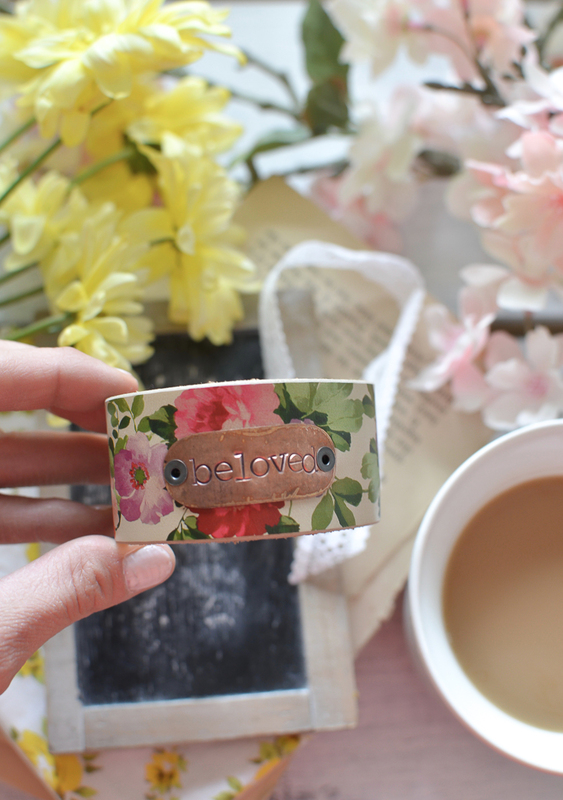 Love, Love, Love your blog and this rose cuff! So pretty! I absolutely love the bracelet. It’ll remind me that the Lord is just a prayer away. Happy Mother’s Day to all the moms out there!!!! ???? What a beautiful cuff!! I would love to win and give the cuff to my Mom for Mother’s Day. I ❤️ your blog! I really enjoy all the creative ideas! I appreciate that you praise our Lord in your posts!!!! Thank You ???? Love the cuff and your website! Been looking at handmade cuffs on Pinterest. I think I will make one from denim and lace. This is so adorable. I would love to give this to one of the sweet girls at church to remind her how beloved she is! Love this cuff. I lost my mother-in-law on April 2 so this Mother’s Day will be bittersweet. She was like a second mother to me. Would love to have this to remind me of her love and God’s comfort he provides in times of sorrow. This cuff is do pretty. I would love to give it to my daughter an operating room nurse. She is a hard worker and sees some awful things. It would be nice for her to be able to look down at her wrist and to feel appreciated. Sarah, I love the cuff bracelet and would have the word, BELIEVE, put on mine if I win it. Believe is a powerful word which gives me the strength to get thru anything and everything. It is my strong belief in my faith in God that guides me through the day and helps me tremendously. I will be celebrating Mother’s Day with my mom and dad and my three children and their significant others with a home cooked beautiful meal I will prepare. Being together is mat important. ???? This Mother’s Day will be spent with my 93 year young Mother, what a joy she is! The cuff is rather wonderful, whoever wins will be very fortunate! Enjoy following you on Instagram! Love these cuffs. They’re so pretty and the words on it are so sweet and powerful. Always love celebrating my mom on Mother’s Day. The sacrifice mom’s make for their children is incredible. I love the cuffs and this one I’d give to my Bible study leader because she had been an incredible blessing and help to my life the last few months! I think it’s the perfect spring/summer accessory! I absolutely love this leather rose cuff. I love roses. It’s my favorite flower. I love wearing bracelets. I would love to win this is would be a daily reminder of how blessed I am. I am a mom of five wonderful children and three grandchildren with one on the way soon. sweet for sure! i love “beloved”… i already have one that says blessed so i think beloved is perfect! 10 years Mothers Day, was the last that I spent with my Mom. The Lord said her work here on earth was done, and she was gone 12 days later. I miss her dearly, and can not wait, until I see her again. Beautiful cuff. Beloved is what I need to remember when the world says I am not enough. God loves me. i am His child. I would love to win this cuff to give to my mom. I look forward to your post everyday. I previously had my house decorated in a primitive country look. I never realized how it was affecting my mood. I have been inspired by your post to switch over to a farmhouse style. Everything that I paint white makes me feel so happy. You are amazing and inspiring. I would be so excited to win. My mama is no longer here but she always made me feel loved. Love the cuff! I have been on vacation doing absolutely nothing so I will be spending my Sunday trying to mentally prepare me for work on Monday ???? Love the cuff, love your words of faith and inspiration and love your posts! Ooooo, lots of comments! That is a pretty cuff! Thanks for sharing the ‘why’ of you having the word ‘beloved’ on it. 🙂 Always good to be reminded of our Lord’s unfailing, unconditional, and unending love! He is good, all the time! Love the cuff, love your blog! What a wonderful message. Every thing I am and every thing I hope to become I owe to my mother. I miss her every day of my life, I lost her in 1986. She was an amazing women. She raised NINE children and every one of us turned out amazing. I would wear this as a reminded of her every day! This cuff is beautiful! Since my Mom passed away a few years ago, I’ll be spending Mother’s Day wth my daughter and her family. The cuff would be a wonderful gift for my young grandchildren to present to their mother! Thanks for the opportunity to win this! The cuff is so pretty, would go with anything! I hope to spend Mother’s Day with my husband and kids, they are grown now, but if not working should be here. If I were to win this, I would have “Faith” put on it, a reminder to have faith that everything will be ok. Happy Mother’s Day to you!! Such a beautiful cuff! It screams life, vibrance, and a fresh start! ???????? The cuff is beautiful. I let my husband and children plan Mother’s Day. They usually do a good job of it. As long as I don’t have to cook or clean that day, I’m good. Normally, just a whole day with my family for brunch. Thank you for the bracelet giveaway and I’m definitely going to check out her website too. I absolutely love this cuff. We spend the day celebrating 3 generations together. I love the message it reminds us of God’s love for us. This is a special Mothers’ Day as I am rejoicing in becoming a grandmother for the first time! The cuff is so beautiful! I love the floral design! I would be so proud to wear this on Mother’s Day. I can’t wait to order a few for my mother and sister ???? I love Mother’s Day because I love the three happy little faces I get to celebrate it with! The cuff is beautiful and a good remember that we are God’s Beloved. Thank you! That is such a beautiful cuff. I have never been a big fan of cuffs since all of the ones I have seen are not beautiful, but this one is and is worth a great deal of wearing! I love all of her unique designs! me and great time to enjoy something I love to do. It is my tradition I hope to pass to my girls!